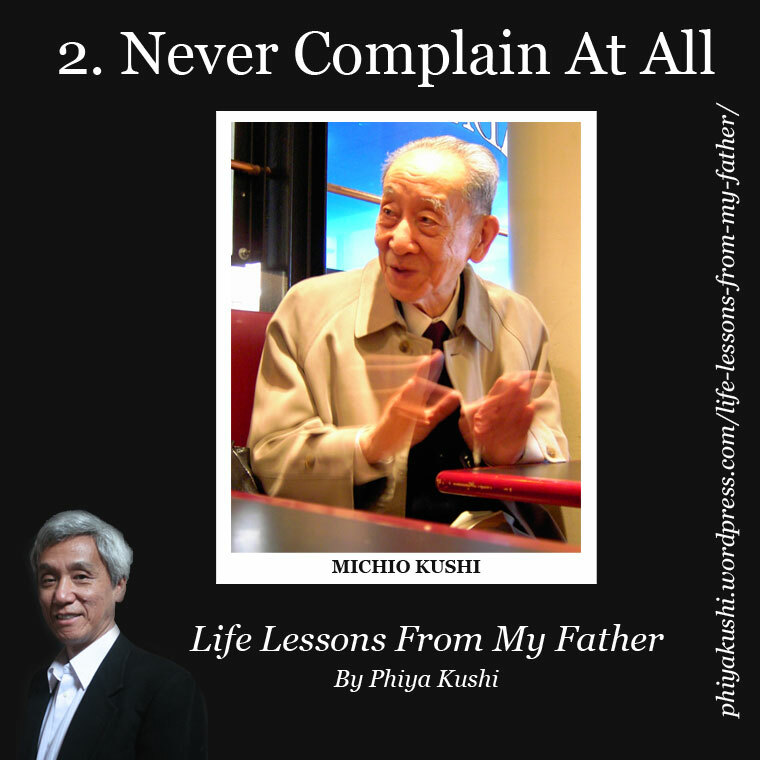 There are many great lessons and words of wisdom that my father, Michio Kushi, gave me and countless other individuals whose lives he touched through his many lectures, books and private consultations. These select life lessons are ten out of hundreds that impacted and influenced my life for the better one way or another. They affected important life decisions, guided me through challenging times, inspired me to strive to be a better person and to learn to always enjoy life under all circumstances. I share them with you here now in the hopes that they may inspire and be as useful to you as well. This isn’t a criticism on prostituting one’s self nor that money is evil but instead is a caution against making a Faust-like bargain of giving your soul to the Devil in exchange for untold riches and earthly pleasures. It is a suggestion to never compromise your principles, passion and dreams for the sake of money or for a cause that you don’t believe in. This doesn’t mean never getting paid to work or turning down money but it does mean to never settle for less than doing something that you feel passionate about and would do regardless of the money. It’s fine to earn money and do any kind of work as long as it is part of a much larger plan that serves you and your own personal development and dream. It’s also fine to work for a company (or a boss) whose principles you don’t agree with as long as it serves your own dream and purpose whatever that may be. In short, work for yourself and pursue your dreams at all times even when you work for others. If you do, you will always have a job that you can never be fired from. Never sell your life. I first heard my father say these words in one of his lectures when I was a young teenager just beginning to think about getting my first summer job. That summer, I applied to work as a bagger for a local supermarket chain. (This was long before the days of natural and organic supermarkets.) On my first day, a neatly dressed floor manager in a white shirt, dress slacks and tie gave me a tour and showed me around. Afterward, we sat down and he explained to me about what made this supermarket different from it’s nearby competitor. He said, “The only difference between the two supermarkets is the service. Everything else is the same. You can buy all the same food there as you can here. So the only thing that can set us apart from our competition is our service including how we dress and take care of our customers.” I sat for a moment and thought about what he said and remembered my father’s words. I realized that it simply wasn’t enough for me to work for a company whose only goal was making a profit by trying to serve their customers better. I believed that quality service should be automatic for all businesses. This supermarket had nothing more to offer and was simply trying to compete with and put the other supermarket down the street out of business. It was a sad and destructive game with no thought on creating a win-win situation. I told the manager, “Thank you, but no thank you.” and with that I quit the very day they hired me. My father’s words instilled in me a selfish attitude about the use of my time and whom should benefit from it. I would not allow this body of mine, this life of mine, to be used for things that I did not agree with. I wanted to work for a company that was making a substantial and fundamental positive difference in people’s lives. I wanted to work for a place where I could feel proud just by being a part of the company. I set high work standards early in life and have kept them ever since. 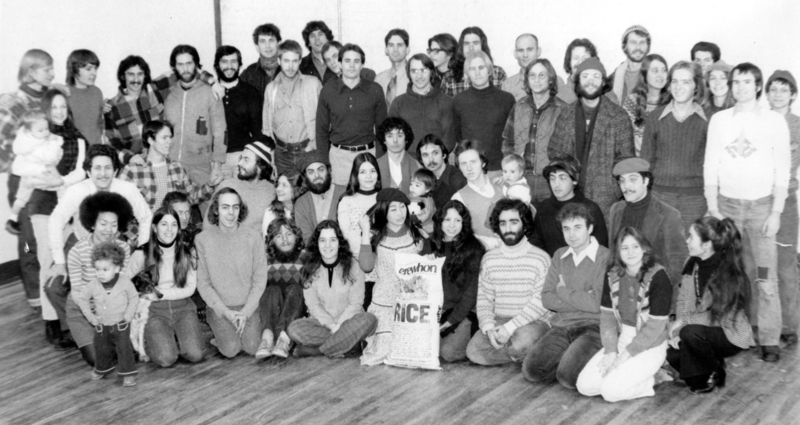 For my first job I ended up working for my parent’s company, Erewhon, the pioneering importer, manufacturer, distributor and retailer that launched the natural and organic foods movement. Unlike the supermarket, Erewhon offered unique food products that were natural, wholesome, informative and educational and were part of a larger vision, philosophy and goal toward building world peace. Erewhon had a mission that I was proud of and could work for. Never working for a company that did not put people before profits and encourage a win-win situation for everyone. Many years ago my father said, “Never complain about anything unless you, yourself, can come up with a better solution that you, yourself, are willing to implement. Otherwise, you have no right to complain.” He never complained about anything and whenever he had an objection to anything he always had a solution. His advice made a lot of sense to me and I have done my best to follow it ever since. It should be noted that there are times when complaining has its uses and advantages. For example, it can be useful to complain to persons in a position to make a difference to change unwanted situations for the better. Also, Freedom of Speech is an important right in the United States and voicing one’s opinion is necessary for social change and responsible political action. Complaining to the right person can make a big difference and is an essential tool in politics today. However, if we become overly dependent on others to make changes for us then we risk losing our own strength and power. People who complain aimlessly and constantly to those who can’t make a difference become victims of their own doing. Without finding their own solutions and acting upon them they give up their own power to change their own lives. They also lose the respect of those around them. This lesson, to never complain unless I had my own solution, inspired me to be much more self-reliant by becoming better and faster at solving problems that came my way. It gave me greater responsibility, self-confidence, patience and creativity. I became better at strategic and long term planning and was able to manage people and run businesses early on in life. I am very grateful to my father for this simple yet powerful and valuable lesson. Similar to “Never Complain about anything” is to never criticize anyone at all. If you have a concern or issue with another person then deal with them directly about it. Otherwise, never criticize them or anyone at all, publicly or privately behind a person’s back. Although I don’t recall my father expressly saying to never criticize others he very clearly demonstrated this by his own refusal to criticize anyone. My father was a very gracious well-mannered gentleman who treated everyone with respect. He always wore three piece suits as a symbol of his respect for everyone he met. When he was out and about walking in town he would always greet everyone he met with a cheerful smile and a “Good Morning!” He was always charming and would try to lift the spirits of everyone he met. When others challenged him, treated him disrespectfully and tried to publicly discredit and stop him he never complained about or criticized them at all. I am not as charming or gracious as my father was yet his example continues to inspire me to never criticize anyone and to always treat everyone with respect regardless of how they treat you. I can count on one hand the number of times I can recall my father getting angry. One of them was in the early 1980s when AIDS had been discovered in the gay population in New York City. The News media were filled with stories of people blaming homosexuality and of homophobic healthcare workers unwilling to treat the afflicted. My father was outraged and took it upon himself to travel to New York City every month from Boston to give free lectures and cooking classes to AIDS patients. He shook their hands and hugged them. Many of the men in attendance broke down and cried because everyone else was afraid to touch them. The result of his efforts can be found in his book, “AIDS, Macrobiotics and Natural Immunity.” That was one of the rare occasions when my father became angry. Unlike his macrobiotic mentor, George Ohsawa, who regularly scolded and berated his own students and many others, Michio gained a reputation early on of always being patient and never losing his temper so much so that Ohsawa intentionally tried to provoke and test him with a very nasty accusatory letter. Michio finally lost his temper and wrote back expressing his anger at Ohsawa. Ohsawa replied in jest by congratulating him on being human, because he, Ohsawa, sincerely had his doubts. Being angry often can be viewed as a sign of being unhealthy. In Oriental Medicine, anger is related to a weak liver. Excessive fat, alcohol, and sweets among other specific foods which tax the liver then makes one more easily prone to anger while healing the liver by avoiding such foods can make one more tolerant and patient. However, when we do feel or have anger within us, then it can definitely be helpful to express it fully in responsible ways that do not cause anything or anyone harm or damage, physically, emotionally and psychologically. If you need to yell and scream then, by all means, do so by going out into the woods alone and yelling your head off to your liver’s content. Just as crying can be healing then releasing one’s anger can help move stagnated energies within the body, but just do so responsibly. Unfortunately, I have been angry more times than I care for and later regretted every time it happened. In my younger years the anger and frustrations I experienced were often uncontrollable. Expressing and releasing pent-up emotions was healing and invaluable to me and I sought ways to do so constructively. Over the years, I became much more patient, tolerant and compassionate. Older now and, hopefully, wiser I find no reason to be angry at all. It took me a long time to finally achieve the tolerant, patient and calm state that my father maintained and displayed throughout his life. So, if you have anger and if expressing it will make you feel better then don’t try to suppress it all. Let it all come out naturally but also try to find out the causes and triggers to your anger and learn to deal with them in other ways and if you keep at it and though it may take a long time, you may find greater calm and peace in your life and be more like Michio. His example continues to be a source of inspiration for me today. First, to clarify, “be grateful for your difficulties” isn’t a suggestion to be masochistic. Second, I am also aware that “difficulties make us stronger” is an over-used cliché and telling someone to be grateful in times of crisis is probably the worst thing to say to them and is definitely the last thing they want to hear. Anyone facing an unexpected and unwanted urgent crisis should be focused on nothing else than practically resolving the crisis itself. In that moment gratitude is not a useful sentiment to turn to at all. Furthermore, even when we aren’t faced with any major challenges or difficulties it is natural to avoid them whenever we can and as best as possible. However and as we all know, difficulties and challenges come upon us whether we like it or not and our view and attitude towards them can make a huge difference in our lives. “Be grateful for your difficulties” is a simple and straightforward reminder to appreciate the unavoidable challenges that we all face in our lives. Through our hardships, difficulties and failures we learn to value and appreciate the simplest things in life. In life threatening situations we become grateful for life itself. Our difficulties also serve as reminders to examine ourselves and our lives and to question our long-held beliefs, values and direction. They serve as opportunities to reflect on our past limitations and explore greater possibilities and new directions that we would have never considered or imagined otherwise. By congratulating me for my illness my father was simply expressing the macrobiotic understanding of viewing illness as a means to help me live longer. It was good fortune and I only needed to see it as an opportunity for change for the better. Without my illness I would never have known that change was needed. It was a difficulty to be grateful for. My father did not limit the scope of difficulties to be grateful for to only health issues. Every type of difficulty was to be appreciated from accidents, tragedies and economic hardships to relationship troubles, social problems and even war. All challenges and difficulties we encountered was an opportunity for growth physically, mentally and spiritually. Challenges and difficulties are not just beneficial for humans but for all living things as well. There is a story about my father that illustrates this point with regard to the difficulties and hardships of plants. Many years ago I accompanied my father to a meeting of advisors for John Denver’s Windstar Foundation. In looking to build a utopian community in the Rocky Mountains there was a proposal on the table to create an experimental thriving Garden of Eden inside a protected Geodesic Dome. The prestigious group of advisers that John had assembled all thought it was a wonderful idea except my father. When it came time for Michio to give his input then, with unassuming grace, he gently pointed out that occasionally exposing the vegetation in the dome to rain and other elements naturally occurring in the Rockies might be beneficial for the plants. He suggested that the dome should at least have a window that could open and close to let these external influences in from time to time. Soon it became glaringly apparent to all in the room that exposing plants to the harsh Rocky Mountain climate all the time, from thunderstorms and even snowfall, was the best and most natural thing for the plants in order to thrive in that environment. The Geodesic Dome was not only unnecessary but was in the way of the difficulties and challenges that naturally helped the plants to grow and become strong and healthy. By suggesting a simple window in the dome, my father, in the gentlest way possible, exposed the folly of the whole idea. In the pursuit of our happiness it doesn’t serve us to make enemies of our difficulties and challenges. Like rain storms and bad weather they come and go often and we must deal with them whether we like it or not. Indeed, they are an essential part of life just as much as are the sunny days and joyous times. By embracing our difficulties we can find happiness in both the worst and the best times of our lives. Be grateful for your difficulties because in overcoming them they not only bring us joy but make life worth living. I have heard my father say this in many lectures. He has also said this in other ways such as “Every front has a back and the bigger the front, the bigger the back”, “everything turns into its opposite and back again” and “there are two sides to every coin”. Although not as profound, we can also understand this concept as the process of weighing pros versus cons when making a decision. However, this statement about angels and devils adds a profound moral dimension that many do not consider and have a hard time grasping. We live in a world defined by the simplistic morality of “good” versus “evil”. It’s in our movies, stories and myths. It’s in our religion and politics. It underlies all our laws and our society. Many cannot imagine a world without enemies, be it a group of people to fight against, a disease or any type of unwanted behavior or phenomenon. If we aren’t fighting tyrants and terrorists then it’s drugs, poverty or cancer. We make enemies out of anything and look to heroes to vanquish our enemies. We become fearful and build arsenals of defenses so large that, if or when unleashed, destroys ourselves in the process of eliminating our enemies. We can’t imagine a world without this duality and therefore the statement “When an angel turns its back it becomes a devil” confounds us. Yet, there are many examples of how angels become devils. For example, today many individuals rely on medicines, pills, supplements and diets to cure themselves and stay healthy. But these things also make us dependent and enslave us just as much as they provide us relief. A pill or medicine is both angel and devil at the same time. It may bring us relief but it does not cure us. An automobile is another example that is both a convenience and burden at the same time. We can go anywhere but then we are also burdened with gas and parking fees, maintenance and repairs costs, insurance and depreciation. In the beginning of a relationship we think the best of our new partner and want to be with them all the time but when the relationship goes sour we want nothing to do with them. The loving beautiful angel they once were becomes a devil, yet it is the same person. Similarly, a mother’s love for her child, on the one hand, is nurturing and selfless while, on the other hand, can spoil, be overbearing and hamper the child’s development. A physician whose oath is to do no harm and who can save many lives can also become a most dangerous person, intentionally or not. A policeman whose job is to protect the community and enforce the law can overstep the very laws he has sworn to uphold. A company whose goal is to produce vast quantities of food is also the greatest purveyor of harmful food products. A country, whose foreign policy is to promote freedom around the world has, through its same policies, caused the greatest amount of war, exploitation and suffering. Angels are devils and devils are angels. We often cite Hitler as the epitome of evil and Jesus as epitome of good. While it is undeniable that Hitler’s Nazi Germany committed various atrocities the ensuing response to his actions and to World War II has been to create a legacy of heroes and a united and global stand for peace and vigilance against tyranny. With regard to Jesus, whose life was devoted to compassion for all of humanity, then in his aftermath, how many have been killed in the name Christianity? How many cultures and peoples have been destroyed by the spread of Christianity? How much hatred, bigotry and violence continues to be created toward women, gays and minorities in the name of Christ and other Prophets of Peace? The work of devils turns into the work of angels and the work of angels become the work of devils. Many years ago someone once asked Michio what would he be doing if the world were “macrobiotic” already; if we had achieved One Peaceful World. His surprising answer was that he would probably be selling junk food and promoting chemical agriculture. His response exposed the relative nature of our morality. The world today was heading toward global degeneration and destruction and the biggest game on the entire planet is to work toward creating a world based on natural order, health and peace. But if the opposite were true – that we lived in a harmonious world of health and peace – then the biggest game on earth would be to move it back toward degeneration and destruction. There is a larger dynamic at work here that transcends our simplistic morality. We can no longer say who is good and who is evil. We all are complicit in creating our opposite. If we understand that angels turn into devils and devils into angels then, at any given point in time, we may know what to expect in the future and, perhaps, even influence this process toward a direction that we prefer. When we begin to see that our world is much more dynamic and fluid than we imagined, then we can learn how to manage our own actions and achieve our goals. If I push in one direction then I may create an opposite reaction and result and the harder I push the greater will be the reaction to me. Similarly, if I drop a pebble in a pond then it makes gentle ripples but if I drop a big boulder then larges waves are created. Aggressive and violent actions always produce a violent and opposite reaction and if stability is our goal then we will never achieve it through violence. Subtle and gentle movements allow us to better manage the unintentional reactions that we create and can therefore help us to achieve our goals much faster and easier. Understanding the dynamics of angels turning into devils is a never-ending study and discipline and makes life a fascinating journey and adventure. This journey continues to unfold for me and as it does I reflect on the influence and effects of my own past actions. Failures in business projects and relationships can all be attributed to the aggressive and bold actions I initiated in the past that ended up producing the opposite result of what I wanted. It took me awhile to figure out that remaining passive and simply accepting what comes my way produced results I wanted much faster and easier. My life has become much more satisfying and continues to be a fascinating journey and it’s all thanks to my father’s lesson that angels turn into devils. 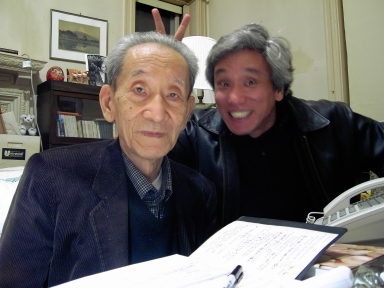 At our father’s Memorial Service my younger brother, Hisao, recalled our father telling him to, “Make sure your life’s dream is something that you can’t achieve during your lifetime.” Our father’s dream was nothing less than creating “One Peaceful World”. My father’s dreams and optimism had a tremendous positive influence on the lives of so many. He counseled thousands with terminal and life threatening illnesses and always found a way to inspire and uplift them. Many recovered and lived well beyond their original prognosis. Beyond this, his grand vision of world peace through a peaceful biological food revolution inspired many to pursue new careers in alternative healing, organic foods and macrobiotic education. His large vision effected my life. When I was young thinking about what to do with my life in the future I asked my father for advice. I told him I was thinking about becoming a writer and he said, “Great! You can be better than Shakespeare! If you want to be a writer then be the best!” I thought he was nuts. I could never be better than Shakespeare. Another time I thought about being an inventor and he said, “Great! You can be the first one to invent a UFO or a machine that provides free unlimited energy” and he would go on and on suggesting many seemingly impossible inventions that would completely change life on Earth as we know it. I asked him once if I could be President of the United States and he replied that I would be a great President, far better than the current one. “Why and how is that possible?” I asked. He said it was because I was much healthier and had much better intuition than the President. The irony was that Nixon was President at the time and later I came to find out that my father had actually personally met Nixon in the 50s when he, Nixon, was a Senator. Whatever thought or idea I had about my future he always took it far beyond my imagination. He did so to expand my narrow limited mind and have me think and dream bigger. Though patronizing, he was sincere and, more importantly, I believed him. By his own example, he showed me that I could dream and achieve anything I wanted to. Halfway through High School I became discontent with the direction my life was heading. I was no longer interested in pursuing a normal education and career path. I felt that following the conventional dictates of society was not going to change anything. I was interested in pursuing something much bigger and larger but I was not clear about what it was. So I joined an experimental educational program that was being offered in my High School where students could participate in how their classes were being taught. It was new and different and the vision was bigger than the normal school offerings. I also enrolled in an experimental college. Every major life decision I made involved looking at the larger picture of life. I had big ideas and big dreams and they gave me the creative inspiration and courage to overcome whatever challenges and difficulties came my way. I still have big visions and dreams. However they are tiny compared to my father’s dream. I asked my father once about his dream of One Peaceful World. I asked him how long he thought it would take for it to be realized. He sat there and thought about it for a long while. It seemed that he was making complex calculations in his head. Finally, he said, “I estimate about 2,000 years.” 2,000 years??!! Whoa! His answer took me by surprise. It wasn’t so much the number of years that surprised me but it was the fact that he devoted his whole life to working on something that he expected wouldn’t be realized for another 2,000 years. I was amazed at his optimism, dedication and commitment to pursing a dream that would remain unfinished long after he was gone. His immense vision and dream was and continues to be an inspiration for me and I remain joyful and optimistic that we will create one peaceful world one day and no matter how long it will take. Thank you, Michio! 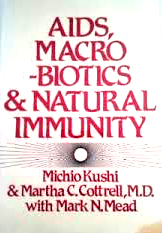 The first chapter of my father’s book, “The Book Of Macrobiotics” begins with the heading, “Life Is Vanity”. It is an introduction to the ephemerality of life; that life is but a fleeting moment and everything we do will eventually pass away. All of our ambitions, our achievements, our struggles and concerns come and go in the larger view of things. Whatever we do will eventually perish and disappear. Everything we do is in vain. That is the first section of the first chapter in the “Book of Macrobiotics”. That is the first lesson in beginning to understand our universe and its order. Michio also always talked about the universe as “One Infinity” and how we are living in it, how we came from it, and how we are returning back to it. 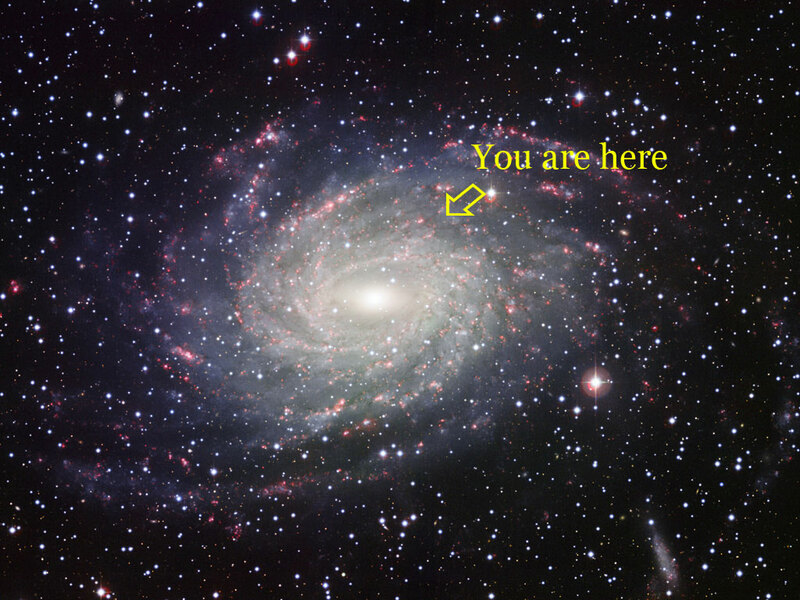 An infinite universe is immense and our place in it and relative to it is pretty small. In terms of scale, Neil deGrasse Tyson (rephrasing Carl Sagan) in the TV Show, “Cosmos”, pointed out that if the entire history of the universe were mapped out onto one calendar year starting with the Big Bang at midnight on January 1 then all of human history would occur in the last few minutes of December 31. Such immense ideas are very abstract and difficult to relate to and therefore are easily dismissed, I prefer to be much more to the point by simply saying this: We are insignificant. We are nothing in comparison to the size and scope of the universe. We are nothing and we should be humbled by this fact. We should be in awe of the immensity of everything else. To bring this to a more understandable scale let’s compare the number of insects there are to humans. It is estimated that the ratio of insects to humans is 200 million to one. For every one person there are 200 million insects on earth. That’s a lot of insects. But let’s not stop there because insects aren’t the most abundant life form on earth. The latest estimate on how many bacteria there are on earth, (according to this article ) is five million trillion trillion. Bacteria and viruses far outnumber all life forms on earth. At only 7 billion we humans are truly insignificant and compared to bacteria it could be said that we live for them. They are the dominant life form, not us and when taking this into consideration then the idea of antibiotics seems like a foolish quixotic attempt to try and control something that we could never ever possibly do at all. Once we accept that we are insignificant and that everything we do is in vain then what are to do about this? We could become depressed and apathetic and no longer care about anything including our own existence. This option leads nowhere but to our own arrogant self-pity. There is another option and that is to stop being arrogant and stop taking our human life so seriously. We are arrogant about our beliefs, our morals, politics, our religion and our identities. We take them so seriously that we will even kill and die for them. Yet they are as insignificant as we are and once we fully accept and appreciate our own insignificance; that we are nothing but an insignificant end product of an immense and dynamic ever-changing universe, then it becomes impossible for us to be so arrogant. The universe is there for us to discover, explore and understand and the first lesson to learn is the humility of our insignificance. Remembering the insignificance of my life has helped me in times of difficulty. It helps me remember that there is nothing worth getting upset or depressed about, let alone killing or dying for. It helps me to remember that there are always others in the world facing much bigger problems than me and even their problems are insignificant. It helps me to remember that I know nothing and that there is so much to discover. It helps me to remember to appreciate this immense universe that created my insignificant life. It helps me to remember to enjoy life and be forever grateful for all that this universe provides. “We are insignificant” is the first lesson in understanding our universe and our relationship to it. It is the first lesson in understanding the size, scope and proportion of things. Beyond this there are many other lessons toward understanding the “Order of the Universe” and how it moves and changes (including how angels become devils). We can study, for example, how we are the product of our environment in its entirety including the foods we eat. We can explore how we are affected by different foods and changes in our environment. We can look at how the earth moves and how it affects us. We can ask ourselves why we have two eyes, one mouth and five fingers. We can ask why Jupiter is so large compared to the other planets and why did ancient people build pyramids. There are so many amazing things to explore and accepting our insignificance and letting go of our arrogance is the very first step and rabbit hole to pass through in order to reach this magic wonderland. In his lectures my father answered many questions from students. He would give elaborate and detailed answers that might take the class on a fascinating and inspiring journey to the far reaches of the galaxy or back to ancient times and conclude with practical and simple actions like chewing your food 100 times. 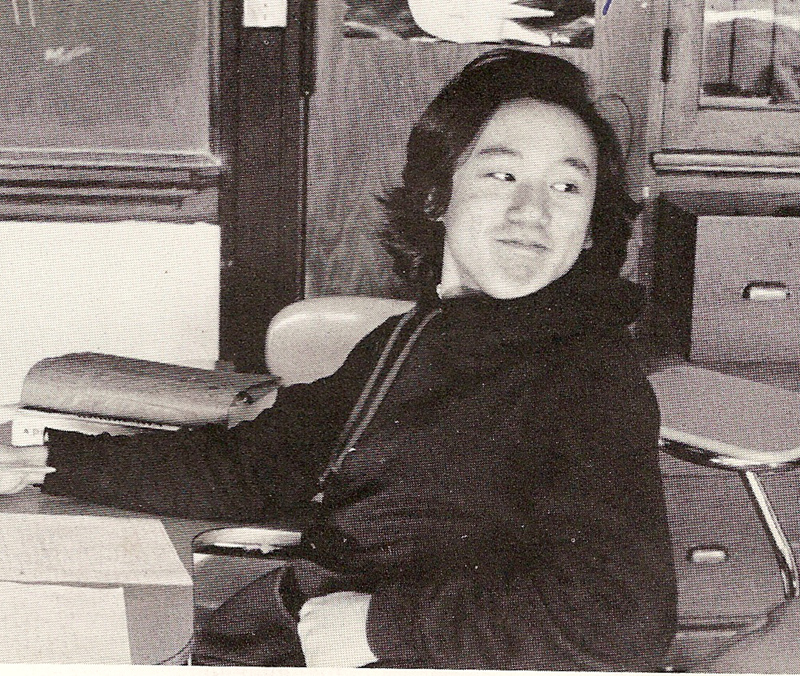 However, there were also times when, in his typical broken English and a thick Japanese accent, he would respond to a question by simply saying, “Please discover for yourself.” Whenever he did this the room would fall into silent reverence of him, with everyone thinking of him as being a very wise sage who withheld answers and challenged his students to actively use their brains and think on their own. Little did they know that his response really just masked his own ignorance on the subject matter asked of him by the student. It was a clever little ploy that he used to encourage others to think instead of simply admitting his own ignorance and saying, “I don’t know.” Fortunately, his ploy worked. The students were inspired to discover for themselves. I was inspired to do so as well. Michio was wise after all. More than just encouraging me to find answers to my own questions, “Please discover for yourself” had a much deeper meaning for me. It was also a suggestion to never blindly believe anything that anyone said or taught including my father. It meant for me to have a healthy skepticism about everything. It meant to never blindly believe anything 100% and to retain at least 1% of disbelief. Conversely it also meant to never reject anything 100% and retain at least a 1% possibility that something could be true. It meant to have an open mind about everything and always maintain that nothing is certain. It meant that if I wanted to discover the certainty in anything then it was up to me to find it and no one else. It meant that I would have to learn how to learn. It meant for me to learn how to use my brain and all other resources available to me. It meant learning how to ask the right questions. It also meant exposing and confronting my own ignorance and to never be arrogant about knowing anything. It meant becoming a self-reliant and free thinker. It meant learning to trust my own instincts and intuition. It meant to “discover myself” and, last but not least, it meant to always retain a humble sense of wonder and awe for everything. Everything is moving and changing constantly in the universe and what we know is also always changing. Never believe 100% in anything. Always allow for a minimum of at least a 1% possibility that you or anyone could be wrong. Let that percent of disbelief, of “non credo”, no matter how small, be your inspiration to “discover yourself”. That percent of disbelief, doubt and self-discovery is your freedom, so never let it go. May you always “discover yourself”. One of Michio’s favorite talks was to ask students what they thought was the purpose of life. They would stumble along with a variety of answers and usually settle on “making a difference” but then would finally be corrected by him. He would simply say, “Life is play” and explain that everyone came to earth to play. (Unfortunately, with his broken english accent some people were confused and thought he said “Life is Pray”. But they would be quickly corrected by their neighbors who understood him), “Life is play” – and that was it and there was nothing more. In other words, there is no purpose in life other than to enjoy life itself. We can be so serious about life. We fight wars and kill each other. According to my father, why we do this is simply because we forgot that we came here to play. We became so absorbed and lost in playing our roles that we forgot who we are, where we came from and why we are here. We forgot that we are only actors on a world stage. We forgot that there is no purpose in life other than to play and enjoy it and when we do remember this then we no longer take things so seriously. We can rewrite the script and choose to play roles that makes us happy instead of ones that cause suffering. There is nothing to be gained or lost but our own enjoyment. Life is play and that is all. Thanks you so much !! I loved your dad! He taught me so much on my macro (GIANT) journey :). Sending love and hugs to you. Thanks for sharing your insight on his wise teachings. I had a wonderful dream of Michio before he left his body, and this is just when i finished my cookbook, I had plans of going to Becket to meet my long time idol. In my dream he looked through my book, like just flipping through the pages, and he laughed and said “OK Pass”. I was thrilled and jumped with joy. I miss you Michio san. And thank you for your years of teaching and making my life meaningful. Thankyou, Phiya! it has been so good to read these 10 Life Lessons again..very useful in the present&brings wonderful memories to mind of Kushi Institute days, East/West Centers&all the studying we did via lectures,cooking&food processing classes,Shiatsu ,etc..am so grateful to have been able to study at the K.I. in London,then Boston..your photos from Alaska so neat to see..the folks i ordered quality products from in Homer are called,Get Healthy Again..they were so kind&helpful..just an fyi about an interesting company/people up there..its great to catch up on facebk..thanks for keeping the spirit alive&sharing your memories&insight..its getting closer to his anniversary..that was such a big day,no true,for all of us! !..i will keep these thoughts&memories close to my heart&practice more vigilantly the 10 Life Lessons..has helped my psyche to tune in to facebk on this winter storm day at home..sending love&graditude to you&want to hear more about your life in Alaska..very cool&adventurous..bravo&power to you..
You had an amazing man for a father. I can only imagine the effect he had on you while here and in going away. Thank you so much for sharing this. It is beyond price.